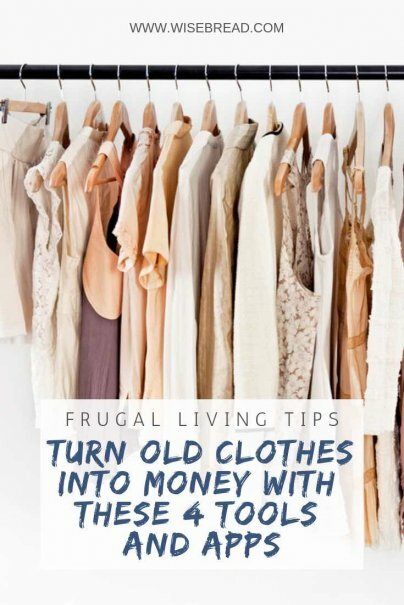 A great way to make extra side cash is to clean out your closet and sell clothes you no longer wear. Not only will you make a few bucks, but you will also benefit from decluttering. Getting top dollar for your used clothing can be tricky, especially if you try to sell your clothes at a yard sale or through a Facebook selling group. Instead, try these top sites and apps to make more on your old threads. Let's start with the most obvious: eBay. It can be a hit or miss for selling clothing. I have listed several higher-end brand name items, such as a rare pair of True Religion jeans, but felt like they did not sell as well as they could have. However, other brands have sold better than I expected. I listed an Old Navy peacoat last winter with the assumption that anything is better than selling it for $2 at a garage sale. The coat sold for almost $40, which was more than I originally paid. So check the recent selling prices for clothing like yours. You can do this by dropping your item into the search box, clicking "advanced," and then check sold listing and hit "search" again. This will allow you to see every similar item that sold in the past 30 days and give you a better idea of how much you can make on your item. Business Insider shared a story of one mom who made $50,000 from selling clothes on Poshmark last year. With PoshMark, you get to set your prices, and listing is as easy as listing on eBay. However, unlike eBay, shoppers prefer better quality photo listings. However, don't let your photo skills keep you from trying the app out. Tradesy is another easy-to-use site that allows you to set your price points for clothes. The site also makes shipping items simple, since the company sends you free shipping boxes and prepaid labels. Tradesy charges a 9% commission and a 2.9% fee if you transfer your earnings to PayPal. And if a buyer decides to return an item, Tradesy will accept the return and allow you to keep your earnings. Don't feel like listing each of your clothing items for sale? No problem. ThredUp allows you to cash in on your clothing with as little effort as possible. All you have to do is sign up for an account and request a free bag from the site. Once your bag arrives, fill it with acceptable items and then seal it. Attached to the bag is a prepaid shipping label, so you can drop it off at the post office or request an at-home pick up. ThredUp is extremely convenient and fast to use, but with that convenience comes a couple minor drawbacks. For example, your items will probably not get you as much as you hoped for. You can request your unaccepted items back, but this will cost $9.99 and it must be selected before you order your bag. It also takes a few weeks for the ThredUp team to process the bags they've received, so you won't get a payout immediately. Still, it's better than having the clothes collect dust in your closet, right? Thanks for the info. 3 of the 4 sites are new to me! Don't bother with ThredUP. I sent a full bag of designer, practically new clothing. They bought two items for $2.25. Total rip off!